After a whole day sightseeing around the Lake District and then a longer-than-expected drive on the motorway, I was looking forward to a quiet evening at Northcote, another stop on the gourmet trip in the north of England. It was a cold and busy Friday evening, and the hotel was bustling. As usual, Darcy, Bob, Russell and I got to our drill of sipping champagne before dinner. With all the travelling during the day, we were quite hungry by the time we made our way to the dining room (despite having a large number of scones for cream tea at Sharrow Bay in Ullswater. 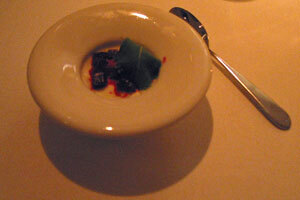 The amuse bouche was goat cheese mousse with beetroot ice-cream and rocket. It was a good balance of flavours in the goat cheese and beetroot, however there was probably a little too much goat cheese but not enough beetroot. The first course was shavings of Radholme wild duckling, smoked foie gras snow, pomegranate, black pudding crumble and watercress. 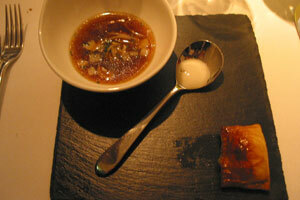 The toast that came with this dish was burnt and actually was a bit pointless (or did none of us get the concept?) – after all it’s not a parfait or terrine or foie gras. The foie gras snow was non-existent in taste – we would not know what the dusting was if it’s not explicitly mentioned on the menu. The duck slices had a delicious flavour but it was a little too cold. 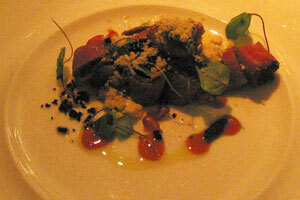 The pomegranite worked well and was bursting with flavour that complemented well with the duck. A few more salad leaves would also be more welcoming. 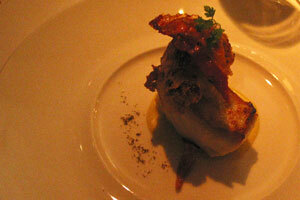 The second course was roast halibut, Shorrocks Lancashire cheese fondue, streaky bacon, tempura Ascroft’s cauliflower. it was a shame that the fish was way too overcooked, resulting in a rather dry texture – other than that, the tempura and bacon worked well with the fish. The celeriac consommé (with partridge turnover and sage) had an intense sweet flavour, though this was somewhat spoilt by the soggy pastry on the partridge turnover. The partridge meat was a little dry also. 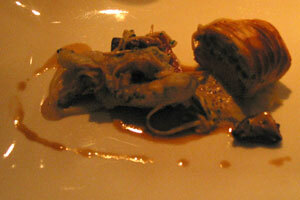 The main course was butter puff pastry wrapped Cockerham goat, cultivated mushrooms, Jerusalem artichokes, savoy cabbage. This was a rather heavy dish: after the last course with the pastry, I thought it was a bit repetitive to have another dish with yet more pastry; and the goat meat and battered vegetables just added to the stodginess of this dish. We all felt rather unhealthy after this main course. 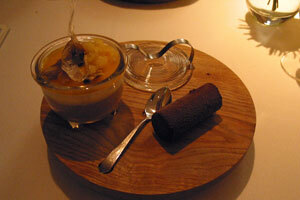 The dessert was quince, chestnut and praline trifle, with sky dancer beer choc ice. The choc ice was so cold and hard that I was worried about cutting into it and then part of it would fly off the wood block and hit someone like a bullet. The choc ice probably came straight out of the freezer and put onto the wood block and served straight away; but it could have been better if it’s left to warm up for a few minutes. I loved the trifle – the quince jelly would have been very bitter on its own but it worked wonders with the rest of the trifle, though I somehow missed any bits of praline that was supposed to be in it?! The meal was somewhat disappointing – the dining room was a bit stuffy and noisy, and the meal was not as good as expected. Was it just below average because its a busy night? I wasn’t sure.